G. Michael Horwitz is from St. Louis, MO. and graduated from Indiana University (B.A. Telecommunications) and the Jewish Theological Seminary in New York City with a Master of Sacred Music and Liturgy including courses in theology and pastoral counseling. He is endorsed and invested by the Cantors Assembly and a former member of their executive Board Council. Michael has served on various committees with the organization which is comprised of over 500 cantors across the globe. 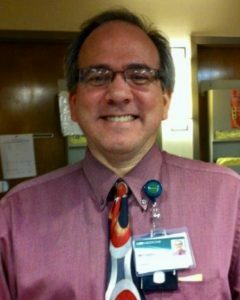 Chaplain Horwitz did an extended unit of CPE at Baptist Hospital in Jacksonville, FL in 2011-12 followed by his CPE Residency with Bon Secours Maryview Medical Center in Portsmouth, VA prior to joining the UAB Pastoral Care team in Sept. 2013. He is a Board Certified Chaplain with the Association of Professional Chaplains. Michael has run 30 marathons including 5 New York City Marathons. He has 25 years of spiritual leadership experience in congregations, hospitals, nursing homes, schools, summer camps, colleges and various agencies providing services, pastoral care and ecumenical programming to families and students. Michael has 2 sons and is assigned to cardiovascular units including Coronary Care Unit (CCU), Cardiac Surgery ICU (CICU), ICVU (Interventional Cardiac Unit), HVC (Heart Vascular Center), and Cardiology.